at Accademia Recording Studio, Verona by Roberto Cetoli. “Nessuno più di un musicista ha la percezione del tempo e del suo scorrere. Non a caso la musica è l’unica arte in cui la struttura temporale è parte integrante dell’opera stessa. E non a caso il musicista è colui che esercita un potere, per quanto effimero, sul tempo, scandendolo, suddividendolo, inquadrandolo provvisoriamente dentro uno schema compositivo. 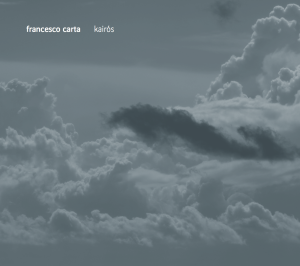 Francesco Carta, intitolando kairòs questo insieme di pezzi, ha voluto fissare del tempo uno dei due aspetti allegorici che lo caratterizzano: quello legato alla gioventù, al rischio (Kairòs, nell’iconografia antica, si mantiene in equilibrio sulla lama di un coltello), all’occasione, al suo svanire vertiginoso. No one better than a musician has the perception of time and its passing. It is no accident that music is the only art in which the temporal structure is an integral part of the work itself. And it is also no accident that the musician is the person who exerts a power (albeit an ephemeral power) on time, by beating it, dividing it, and provisionally inserting it within a compositional structure. By calling this set of pieces kairòs Francesco Carta wanted to establish one of the two allegorical aspects that characterize time: that connected with youth, risk (in ancient iconography Kairòs is balanced on a knife blade), opportunity and its wildly fast disappearance. In a famous aphorism Hyppocrates said: “Life is short, art long”. Hence the asymmetry between our works, which are planned to last, and the short journey of our own existence. Kairòs is nothing but the instant in which the two intersect, it is the “very fleeting” moment in which life is filled with a decision, with an opportunity to be taken, with a meaning to be grasped without delay. This is perhaps how poetry is born; this is how a sequence of notes is generated; this, deep down, is how art suddenly finds what it is looking for. Nothing is more exalting and nothing more tragic than opportunity. It is a promise that opens out and at the same time a cruel loss that is anticipated. It is the double substance of all things: to add a thread to our lives, but also to break another. Francesco Cartaʼs kairòs must be understood (and heard) like this: as a vibration of happiness within the irremediable melancholy of one who knows he has already lost it.